CND co-founder and style director Jan Arnold has true atistic talent. These are the sketches she drew of the nails for Libertine. 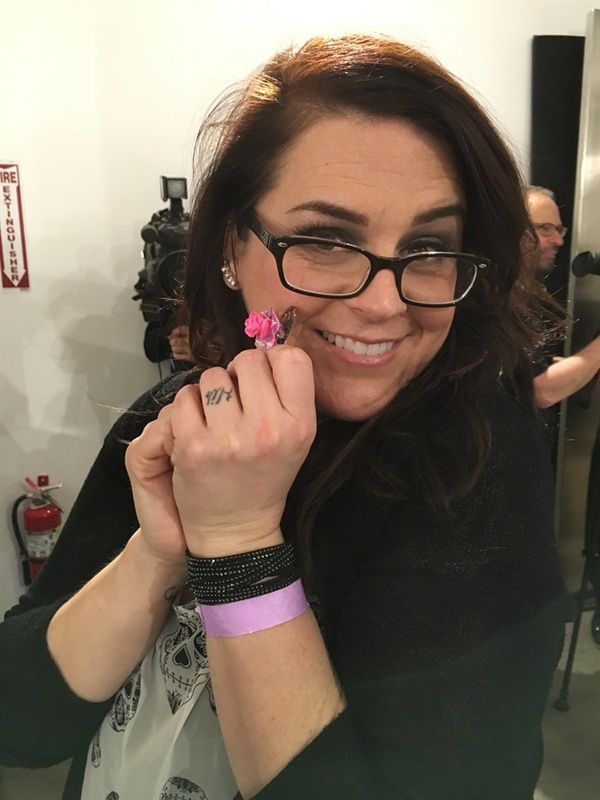 CND Education Ambassador Heather Davis admitted she hadn't sculpted flowers before doing them for The Blonds show. 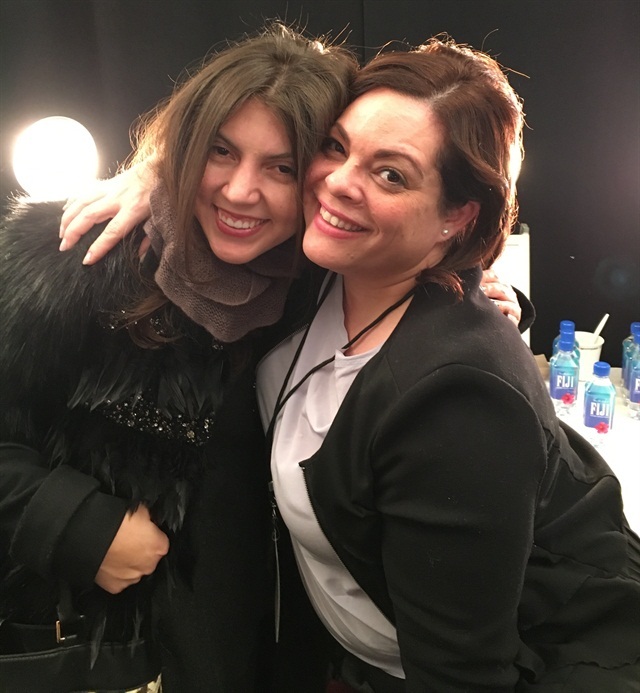 Zoya lead manicurist Naomi Gonzalez (right, backstage at Marchesa) is the director of education at Empire Beauty School. 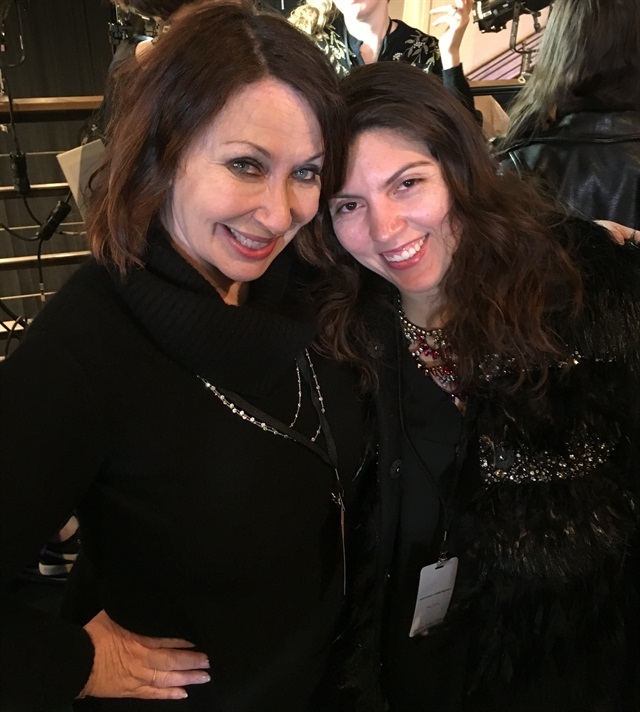 Nail tech and business woman Deborah Lippmann flew to New York for back to back shows (Narciso Rodriguez and Brandon Maxwell) immediately after doing Ellie Goulding's nails for the Grammys. 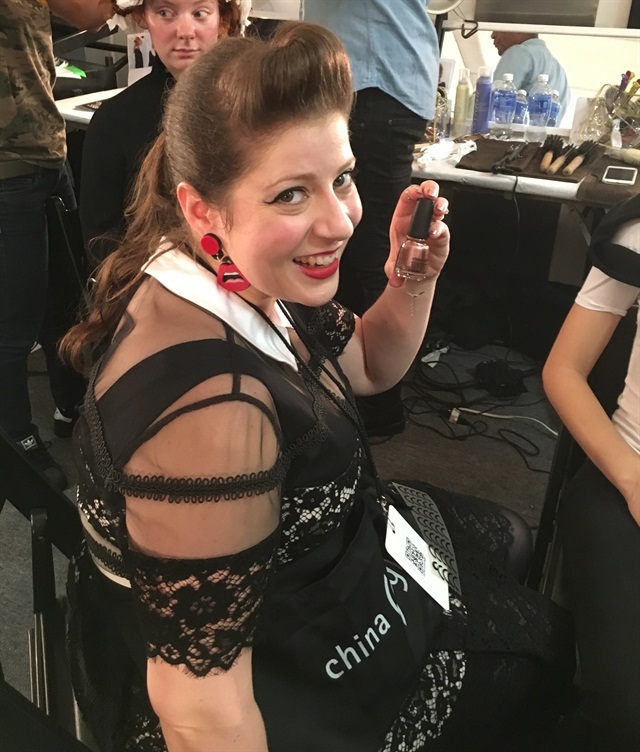 Lauren Wireman didn't travel to New York for Fashion Week, but she did send in these nails for CND to use at The Blonds. The designers liked them so much they requested a pink set too. Nail biters rejoice! CND discovered a way to create edible nails. The only catch: the cookies they had in mind were smaller. The bakery they used said this size was the smallest, so the cookies ended up eclipsing the doily stamped nail tips. CND had originally wanted the eyes on the Libertine runway to light up. 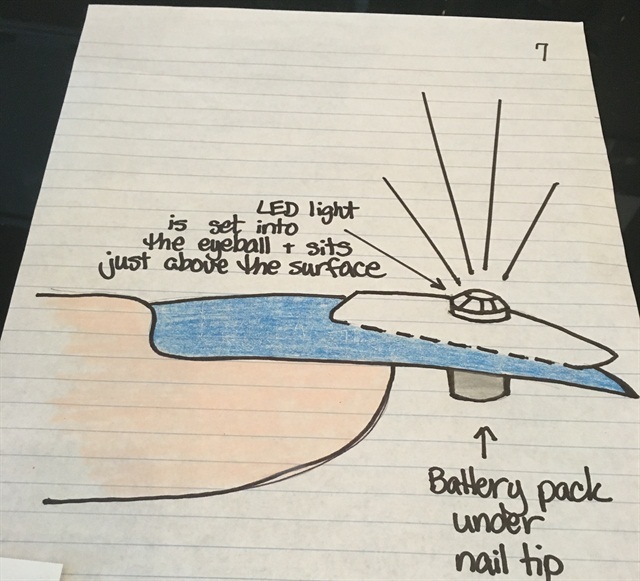 However, designer Johnson Hartig decided at the last minute that the LED lights would take away from the nail color. Nail artist and China Glaze lead Miss Pop did the nails at Alice + Olivia. 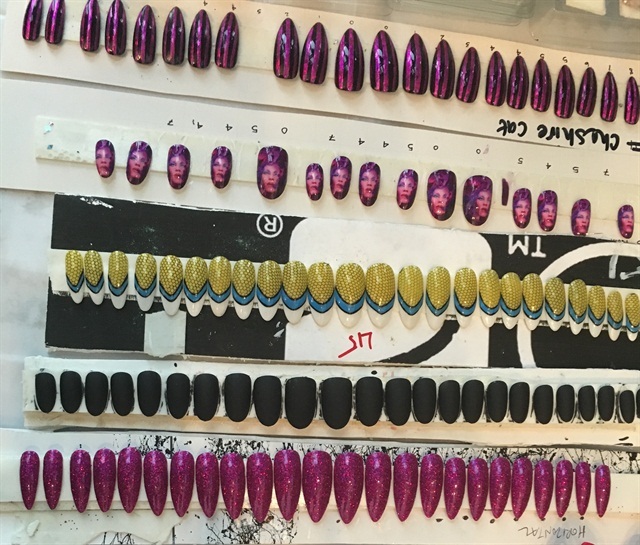 What many don't realize is that Miss Pop has done designer Stacey Bendet's nails before, and is even responsible for creating the Stace Face nail art associated with the brand. 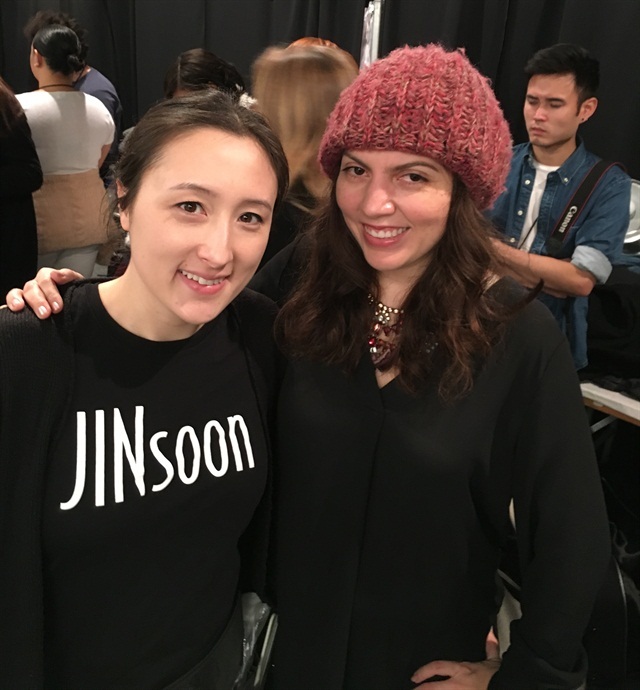 Reiko Omae (left), who worked with JINsoon, is the NAHA winner for the nail category. Nail art isn't just for nail tips, as seen at CND for Libertine. Designer Johnson Hartig liked the eye-shaped artwork so much that he decided to have them made into rings and pins so they could be worn off the nail as well. Designer Philippe Blond always has a set of nails with his face on it to wear for The Blonds show. See a complete rundown of the nails at NYFW here.